Earlier this month four youth from a church in Armenia, Colombia, completed their visit to Costa Rica as missionaries-in-training. During their time here they served in various ministries through the church I’m a part of (Amistad Internacional in San Francisco de Dos Ríos). They plugged right into the church and helped out tirelessly for about two weeks at our church VBS activities and different ministries members of our church are involved in (Funda Vida, YWAM, Latin Link in Los Guidos, Edutecnología, and a young church in Paraíso, Cartago). Each visiting missionary was placed with a family from the church while they were here. They eagerly embraced each new challenge they were given. 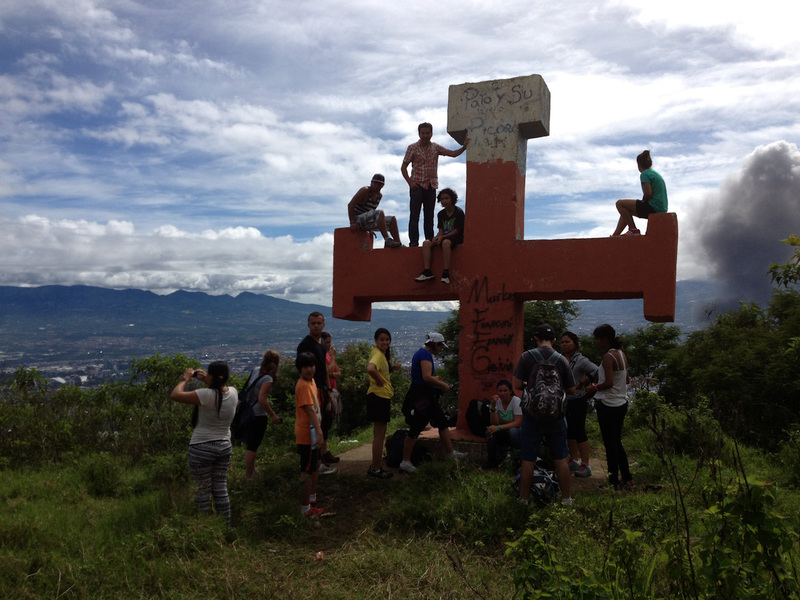 I led them on a Saturday hike up to Las Tres Cruces de Alajuelita along with our church’s young adult group. Two weeks before, I’d arranged the same hike, which 5 people confirmed to attend and no one showed up. This time, 8 people confirmed and 17 showed up. So we ended up using public busses to get up there and back, and everyone survived the 17 km trek. In the farewell meeting at our church a week-and-a-half later, one of the girls mentioned the grueling hike was a good “metaphor” for the perseverance and resolve they needed for their busy time in Costa Rica. I found the comments by other church members very interesting as well. Our congregation is a small mix of several different nationalities, mostly from Central and South America, but the majority are Colombian. They seemed very proud, honored, and hopeful to see young Colombian missionaries-in-training visit from their own country. “These four have what it takes, they sent us the cream of the crop,” seemed the general sentiment. I gathered that it was very impacting to the Colombian foreigners living in Costa Rica to host youngsters from their own country hoping to one day be missionaries in other countries. For an anthropology report I did some research on Colombians living in Costa Rica. There are a lot of Colombians living in Costa Rica – about 30,000. As foreigners living in the country, they are second in number only to Nicaraguans, by a long shot, and about equal in number to U.S. Americans. Of foreign nationalities living in Costa Rica, 74% are Nicaraguan, 4.3% are Colombian, and 4.1% are U.S. Americans. Costa Rica has a history of providing amnesty for refugees from other countries, and Colombians currently form the largest group with refugee status living in Costa Rica. Colombia produces more refugees than any other country in Latin America (396,000 forced from the country), and has the world’s second highest count of internally displaced persons (IDPs) after Sudan, and possibly Angola. Whereas some their compatriots may not have come by choice, these four youngsters did. That may be part of the reason the older generation is so proud to see others making the effort to travel to foreign countries and share in a missionary vision, with the support and backing of others who have gone before them.